Wonderful One – Lemon Olive Oil Layer Cake with Coconut Whipped Cream Frosting | EmmaEats…and Katie too! Let me start by saying I cannot stop eating this cake. I have made two of these cakes in the past 2 weeks. And no, I didn’t eat both of them all myself – one was actually for Katie’s first birthday party. What a glorious day! Our dear little Katie soaked up all the love from our family and friends that summer sunshine-filled afternoon. She made her entrance after nearly all of the guests arrived and socialized while eating tonnes of ribs at the party but was too full to eat any cake. To ensure she had her first birthday cake moment, after recovering from the festivities, I forged ahead and made a second one. This cake has a few unique qualities as far as birthday cakes go — it is dairy-free. 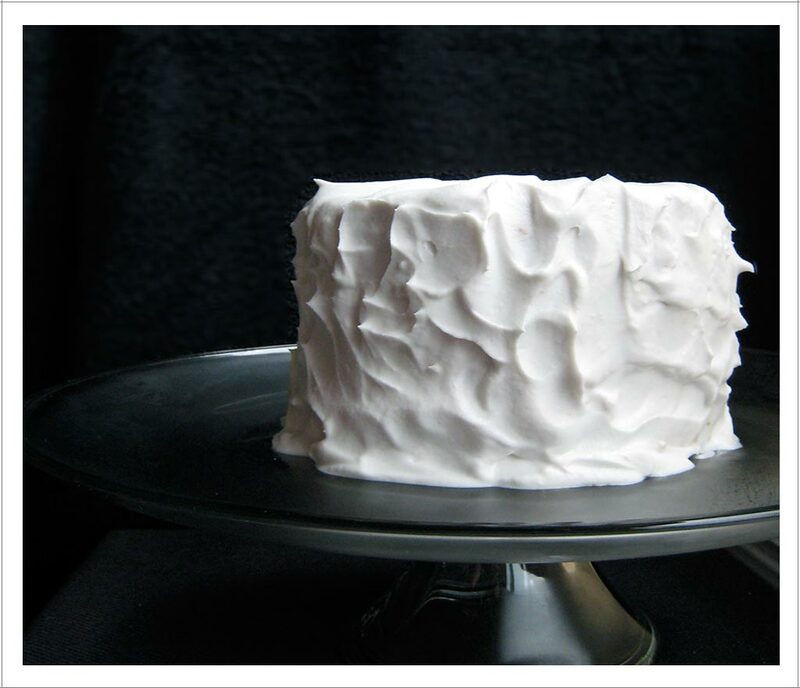 It’s also topped with billowing clouds of coconut whipped cream rather than a sugary frosting. Katie’s been reacting to dairy products and so rather than risk having an issue on the day of the party and because our friend Sweet Little Man was going to be joining us too, it made sense to go this route. Also, separately beating the egg whites and folding those into the batter helped make this cake incredibly light and fluffy. What a treat this lemony cake turned out to be on a hot summer afternoon! It’s been an eventful first year for our little Katie – we hope you enjoyed your big day, lovey. Happy Birthday to our determined, charming and playful, caring and outgoing little girl – I’m a very lucky mummy to have you as my wonderful one! Place the cans of coconut milk in the refrigerator and chill them overnight. Keep them refrigerated until you are ready to frost the cake. Whisk together the flour, lemon zest, baking powder and salt. Set aside. In a large bowl, beat together the olive oil and sugar until light. Add the lemon juice and mix for about 10 seconds. Then beat in the egg yolks one at a time until well combined. Add the flour mixture a couple of tablespoons at a time and mix until all the flour has been incorporated. Set aside. Whip the egg whites until foamy. Slowly pour in the 1/3 cup of vanilla sugar and continue whipping the egg whites until soft peaks form. Mix 1/3 of the egg whites into the olive oil batter. Once well combined, gently fold the remaining egg whites into the batter. Pour the batter divided evenly across the three prepared cake pans. Place two of the cake pans on the top shelf of the oven and the third one on the bottom shelf and bake until lightly golden for 20-25 minutes, switching the pans halfway through the baking time. Start checking the cakes for readiness at 20 minutes by pricking the centre of the cake with a toothpick. If it comes out mostly clean, the cake layer is ready. A few crumbs on the toothpick are ok; anything more and add at least another 2 minutes of baking time. Remove the pans from the oven and run a sharp knife around the outer edge of the cake layers. Let cool for 5 minutes in the pan and then invert on to rack. Remove the parchment paper and invert the cake layer again. Let cool completely before assembling and icing the cake. To make the “buttercream” icing for between the layers, mix together the Earth Balance, icing sugar and lemon juice adding a little more sugar to taste. Divide the mixture in half. Spread one half on the bottom layer of the cake. Place the middle layer on top of the icing and spread the other half of the icing on it. Then place the third layer on top. Refrigerate the assembled cake while preparing the coconut whipped cream. Open the cans of coconut milk and carefully remove only the solidified cream from the cans and place into a large bowl. Whip the coconut cream for 3-5 minutes, adding the icing sugar (to taste) about 1 minute into the total time, until stiff peaks form. Dollop the coconut whipped cream around the edges and on top of the cake. Using an offset spatula, spread the frosting around the outside of the cake. Forget to put the coconut milk in the refrigerator the night before? Just chill the coconut milk in the freezer for ~2 hours rather than letting it sit in the refrigerator overnight. Here’s another recipe where you should prepare and measure out all of your ingredients (specifically for the cake layers) before you start. The long the olive oil batter sits, the thicker it becomes and your cake will lose some of its lightness and fluffiness. You can substitute granulated sugar for the vanilla sugar in this recipe. Then, make your own vanilla sugar for next time. Take 1 or 2 vanilla bean pods and place them into a glass jar that seals. Then, top up the jar with 2-3 cups of granulated sugar. Seal the jar. Stir or shake the sugar mixture once daily. It’ll be ready to use in about 2 weeks. Every time you remove some sugar, be sure to top it up and stir in the new sugar again. Make the coconut whipped cream up to 2 days in advance. After whipping the cream, refrigerate in a covered container. Remove from the fridge 15 minutes before you want to use it on the cake. Make the lemon “buttercream” in advance as well. After making the icing according to the directions above, refrigerate in a covered container and let it sit at room temperature for 15-20 minutes before you use it on the cake. Thanks Julie – so happy to share! I’ll have to make it again soon. Hope you’re well! It was such a pleasant surprise to see how well coconut cream actually whipped up. You won’t be disappointed! Good luck with the cupcakes — I’m looking forward to hearing about them.